Co-generation has been understood to mean the use of surplus process heat to generate electricity, or combined heat and power (CHP). The meaning has expanded to include combined power and heat (CPH), where power production is the primary purpose. With the increasing use of fuel cells, the options of fuel cell based CHP is extensive. The inclusion of gas as a generation fuel in the country’s future energy plans, particularly those situated in industrial towns or industrial parks, opens new possibilities for co-generation or CPH operation of gas-fuelled generation. Although the programme is based primarily on large centralised gas turbine generation, developments in fuel cell systems offer an alternative for distributed generation systems. Table 1: Characteristics of common fuel cells . The use of fuel cells for on-site generation of electricity is receiving wide attention worldwide, specifically for commercial buildings, hospitals, university campuses, and residential apartment buildings. In fuel cell research, attention has, to date, mainly been focused on improving electricity generating efficiency of systems, but increasing attention is being given to waste heat utilisation or recovery to improve the overall efficiency of the system. 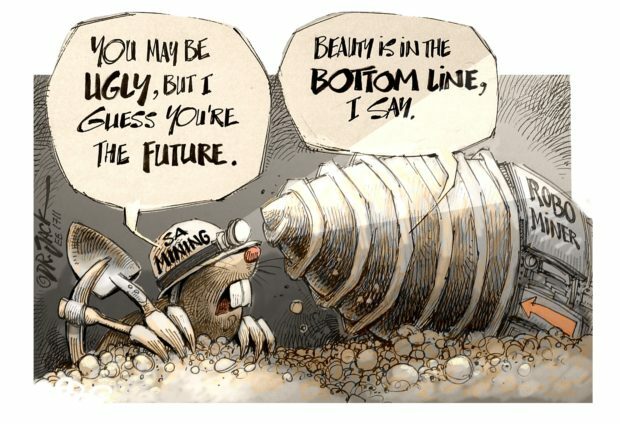 The use of gas for generation is being pursued widely, primarily because of lower CO2 emissions but also because of the abundance of lower priced gas sources. Most systems make use of centralised large gas turbines which produce a large amount of waste heat. Closed cycle systems re-use this heat to power steam turbines, but a large amount of heat is still lost in the process. Fuel cells running on gas or hydrogen, which also produce waste heat, are becoming more popular as on-site generation systems. The use of such distributed generation has the advantage of allowing waste heat to be used directly on site – with fewer losses – for other applications, giving a much higher overall efficiency, than the centralised gas turbine application. Fuel cell CHP systems are being developed for a wide range of applications, from industry to commercial buildings to large scale residential uses. 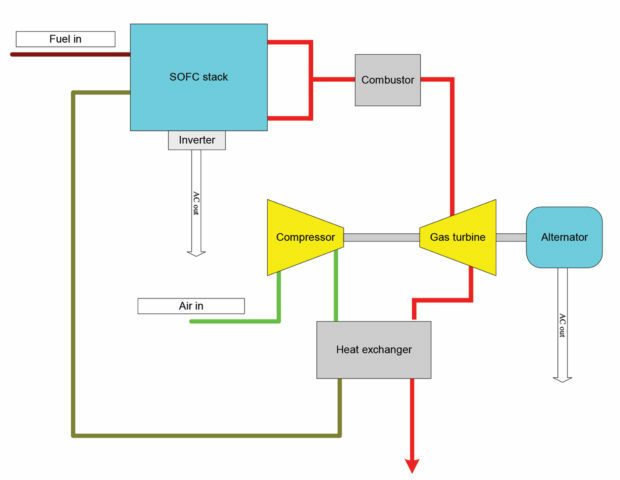 The use of fuel cell CHP could supplant rooftop solar in countries with poor solar radiation, and which already have a well-developed gas supply. In addition, the proposals to use surplus wind energy to generate hydrogen, which could supplement natural gas makes the process partially or totally renewable. Fuel cells, powered from hydrogen generated by surplus renewable energy (RE), as embedded generation providing both power and heat could function as a reliable and controllable renewable source alternative to both solar PV and solar water heating in residential buildings. Fig. 1: Simple hybrid system. About 50% of the energy in a fuel cell system is converted into electricity, the rest of the energy is lost as heat (fuel cell cooling system and exhaust gas heat). If some part of the waste heat can be re-used, the energy efficiency of fuel cell systems would be improved greatly. Waste heat may be used for the hydrogen reforming process, or to preprocess the gaseous fuel. Waste heat can be used for steam or hot water generation in commercial and residential buildings. Waste heat could be used in cooling systems in buildings. 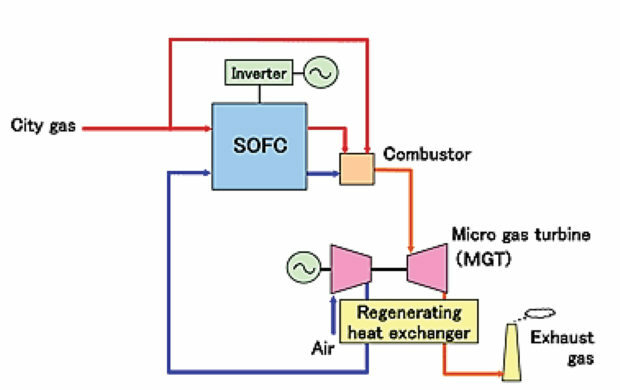 In a complete turn-around of the waste heat recovery concept, the heat from the fuel cell exhaust gases can be used to power a micro gas turbine (MGT) to generate additional electricity. Perhaps the most interesting application from a generation point of view is the hybrid fuel cell/MGT system. The rest of this article will focus on this application. With new energy generation technologies comes the possibility of new applications. Fuel cells are a well-developed technology with many systems in operation. The increasing size of fuel cells has made the use of waste heat to power downstream generation of additional energy a viable proposition. Fuel cell exhaust gas temperatures range from approximately 100 to 1000°C depending on the technology and the fuel used. Fuel cells with high temperature exhaust gas are the most suitable for hybrid system operation. Distributed power generation via combined heat and power systems, has been proven to overcome the disadvantages of a centralised plant, since it can provide savings in terms of primary energy consumption and energy costs. The main advantage is that m-CHP systems are able to directly recover and use the heat that in centralised systems is often lost. The already high efficiency of fuel cells can be increased from around 47% to as much as 80% or more, depending on design and installation parameters. Fig. 2: Advanced FC/MGT design. Table 1 lists the characteristics of the main fuel cell types. Although PEMFC is an efficient electrical producer it is a low temperature technology producing low grade heat (50 to 130°C), and its use in hybrid systems has not been considered in any detail, other than one study using the organic Rankine cycle. High temperature (150°C) PEMFC systems have been found suitable for small domestic CHP systems . The PAFC is a medium temperature unit producing low grade heat which finds applications in hot water and steam generation applications. MCFC and SOFC systems produce high grade high temperature heat and both technologies are considered suitable for FCMGT systems. High temperature fuel cells do not need external reformers for hydrocarbon fuels. 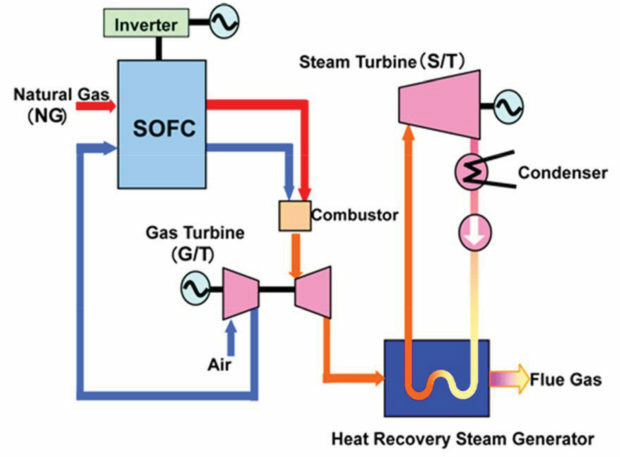 In a complete turn-around of the waste heat to power concept, the exhaust gases from fuel cells may be used to power gas turbines in a hybrid configuration. Fuel cell systems are generally in the power range from several hundred kW up to 1 MW, and this range suits the MGT ideally, with its power range of several hundred kW. Fig. 3: Proposed triple combined cycle power generation system . Hybrid power systems consisting of high temperature fuel cells and gas turbines have been on trial for several years. Several companies have ongoing field trial and demonstration units operating. The size of these units run from about 250 kW to 5 MW . Typically, these power plants use either the SOFC or the MCFC fuel cell in combination with a gas turbine to increase overall thermal efficiency, with predicted efficiencies of 65 to 75%. This compares to 60% for the best of the conventional thermal combined cycle generation plants in common use today. Currently, efficiency of the hybrid systems is in the 60% range . Designs are based on the high temperature SOFC systems and use a variety of gaseous and liquid fuels. The simple form of the hybrid is shown in Fig. 1. Fuel and air are fed into the fuel cell and the exhaust gases are used to drive the MGT. Exhaust from the MGT is at about 200°C which can still be used for water heating. High temperature fuel cells are used in this application, as they operate well under the pressures and temperatures needed. In the case of SOFC, the pressurised environment improves the fuel cell efficiency. The turbine is able to recycle thermal and pressure energy that would normally be discarded. Combustor: downstream from the outlet. The exhaust gas from the FC contains uncombusted fuel and combustion increases the pressure and temperature of the exhaust gas. Compressor stages: these are used to compress both the input fuel and the air input so that the FC operates under pressure and the exhaust gas is also under pressure. Fuel reformers: use heat from the cell to reform different fuels into hydrogen and other components. Air preheaters improve the efficiency and operation of the plant. The combustor in a SOFC/GT hybrid system is used after the fuel cell stack to burn the remaining fuel (generally the fuel utilisation in a SOFC stack is around 80%). The combustor should be specifically designed for the hybrid system; a commercial combustor cannot be used because the exhaust from the SOFC has a very low calorific value and diluting air is not at once available at sufficient temperature. However, combustors specifically designed for an SOFC can operate over a large range and at the same time achieve very low emissions . Fig. 4: The Siemens Westinghouse 250 kW pilot FCMGT unit . Some of the waste heat from high temperature fuel cell systems can be used for the fuel reforming process, which involves the conversion of hydrocarbons into hydrogen and carbon monoxide or carbon dioxide. There are three methods of reforming: steam reforming, partial oxidation and auto-thermal reforming. 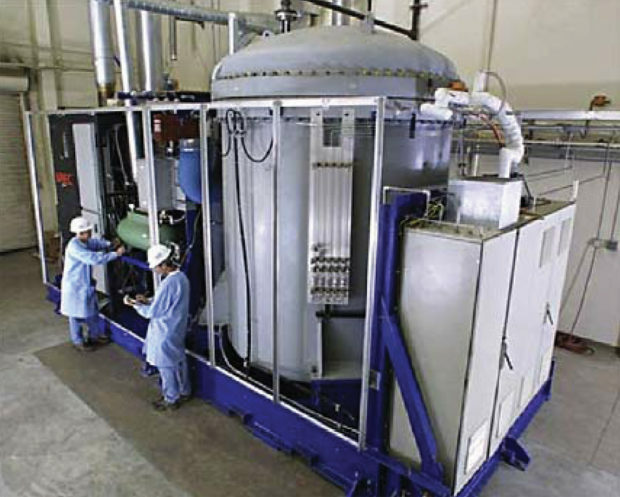 Some high temperature fuel cells do not need external reformers, but the addition of a reformer has been found to improve performance and allow better control over operation. An advanced design of FC/MGT hybrid is shown in Fig. 2. Mitsubishi Heavy Industries (MHI) announced in 2012 that it would begin developing basic technologies for a triple combined cycle power generation system integrating SOFC and a gas turbine combined cycle (CCGT) power generation system. Whereas the previously mentioned systems are megawatt or sub-megawatt in size, the MHI project is aimed at tens and hundreds of MW. In a system of this size, sufficient waste heat should be available to power the third stage of steam generation. In a triple combined cycle power generation system, an SOFC power generation system is placed before the gas turbine combined cycle system. 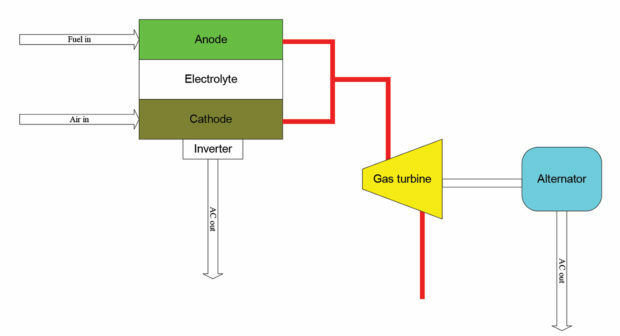 By generating power at three stages – the fuel cell, gas turbine, and steam turbine – the resulting fuel cell combined cycle (FCCC) system is hoped to achieve high efficiency in generating power from natural gas. The FCCC system is expected to achieve the world’s highest power generation efficiency exceeding 70% for several hundred of MW class of power generation and over 60% efficiency for several tens of MW class of power generation. MHI says FCCC triple combined cycle power generation will result in 10 to 20% improvements in power generation efficiency over existing natural gas-fired power generation systems. The company plans to pursue development based on the results of the basic technologies study, with the ultimate goal of commercialising the technology. Fig. 5a: MHI FC/MGT unit . Ingersol Rand: size is 70 kW (oversized) with only 20 to 30 kW produced in this configuration. Dual shaft microturbine: high pressure turbine drives compressor; low pressure turbine drives AC generator. Pre-reformers located in the stack to generate H2 from natural gas. Fig. 5b: Diagram of MHI unit . The system has a total output of 220 kW, with an output of approximately 180 kW from the SOFC and approximately 40 kW from the micro-turbine generator. Early tests showed a fuel to electrical efficiency of 53% . Improvements are expected to raise this to 70%. MHI has achieved 4000 hours of uninterrupted operation of a 200 kW class pressurised hybrid (combined-cycle) power generation system incorporating SOFC and a micro-gas turbine (MGT). The company has been operating the hybrid system at Senju Techno Station, a facility in Tokyo and it has now confirmed its stable power generation performance of 206 kW AC and 50,2% thermal efficiency . J Brouwer: “Hybrid gas turbine fuel cell systems”, National Fuel Cell Research Centre, University of California.